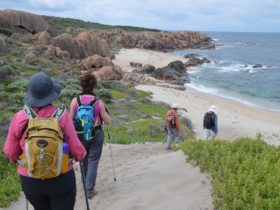 As part of World Expeditions, Australian Walking Holidays is a fully Australian-owned company specialising in small group guided walking adventures. Since 1982, they have been guiding small groups of travellers on Australia’s finest walks. Whether you’re interested in trekking Australia’s iconic Larapinta Trail in the Red Centre, Tasmania’s spectacular Overland Track, the Jatbula Trail in Top End, Kakadu, the Bibbulmun Track, the Heysen Trail and Flinders range as well as the Kimberly, tropical north Queensland and south western Australia – you can be sure your experience will be an unforgettable exploration of Australia’s stunning and diverse landscape. 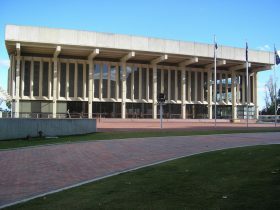 Their experienced guides are experts in the field and have high respect and love of the Australian landscape. With responsible travel at the core at everything they do, you can be sure your journey leaves no trace and takes into account the local wildlife, wilderness and cultures of the land. The Bungle Bungles – Purnululu – have legendary status as one of the most unique and remote natural wonders in Australia, if not the world. The splendid isolation of the Bungles is a great attraction to trekkers. Using specially chartered flights, this tour avoids the long hard drive to get to the Bungles, allowing you to delve deep into the heart of this world heritage wonder. Exploring the Piccaninny Gorge, this trip offers you an achievable expedition style bushwalk. The walk follows the gorge as it winds its way between the red and black beehive domes. They’ll establish a base camp for a few nights, freeing you to make lightweight exploratory walks high into the upper gorge, stopping at waterholes and caves, soaking in the wild seclusion. Your ultimate destination is “The Fingers”, five sandstone chasms made for rock-hopping and sun-soaking, looking to discover the mysteries held within this ancient and weathered land. On the final day you will trek out to Cathedral Gorge before a short transfer to the airstrip to board a stunning scenic flight over the Bungle Bungles and the Kimberley back to Kununurra. Discover all of the iconic features of the Kimberley including Mitchell Falls, the Bungle Bungles, the Gibb River Road, Elquestro, Emma Gorge, Home Valley, Mornington Wilderness, Windjana Gorge, Tunnel Creek and more. Enjoy nine spectacular nights camping under the stars in the most breathtaking surrounds where you awake each day to a dawn chorus to continue exploring the treasures of this ancient landscape. 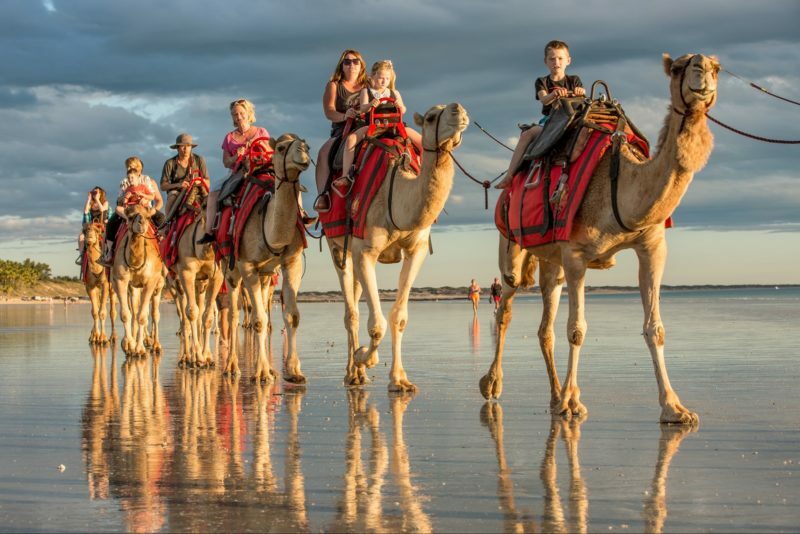 This tour operates from Darwin to Broome or in reverse from Broome to Darwin. The Kimberley region of Western Australia is one of the world’s last great wilderness areas. The coastline is simply spectacular with deep gorges, coral reefs, mangroves and huge tides providing some of the many natural highlights. Utilising a 20 berth expedition cruise boat, you can access some of the Kimberley’s wildest coastline in comfort, avoiding the need for weeks of punishing overland four wheel drive travel to experience the magic of this rugged region. The cruise north of Broome will explore some of the Kimberley’s best kept secrets and place you amongst her astonishing beauty and diversity. During your days on board the Odyssey, the accent will be on day walks and shore explorations including visits to the Lacepede Islands, Montgomery Reef, Horizontal Water Falls, Sale River, Prince Regent River, King Cascade and Camp Creek to mention just a few destinations. From Naturaliste Island you’ll enjoy a stunning helicopter flight over the Mitchell Falls to join your charter flight back to Broome where this extraordinary wilderness experience concludes. Trackless and extremely rugged, the coast and hinterland of the West Kimberley is one of Australia’s last true wilderness regions which is most easily accessed by boat. 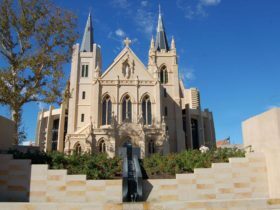 This ultimate highlights itinerary condenses several Kimberley icons into a single voyage including the King George Falls, the Hunter River, the Prince Regent River, Montgomery Reef and the Horizontal Waterfalls. These places feature stunning scenery including gorges cut through the ancient sandstone and offer access into a beautiful and wild world. Tranquil pools, rapids and waterfalls, terraces of rock, white beaches, ancient rock art, stately stands of tropical paperbarks, patches of monsoon rainforest and always a backdrop, the red rocky ramparts. During the trip you’ll have the opportunity to ‘land a barra’, enjoy gentle walks, try mud crabbing, swim in idyllic billabongs or even view many of the sites during a helicopter flight (purchased additionally onboard). There is also an opportunity to see the “Bradshaws” – possibly the oldest art known to man. Each evening you will relax to fine wine and food on your luxury vessel, the True North, which carries only 36 guests. The Bibbulmun Track is a popular Western Australia walking opportunity which explores the magnificent National Parks, Karri forests and pristine coastlines of the state’s magnificent southern wilderness. This wonderful section of the Bibbulmun Track between Walpole and Denmark is possibly the most scenic and varied section of the whole track. The walk takes in majestic forests, deserted beaches, magnificent bays and spectacular coastal cliffs. You’ll visit the Valley of the Giants in Walpole and see the beautiful rock formations and tranquil waters of Greens Pool and Elephant Rocks near Denmark, and many sights between. The hills and some beach sand sections can add to the challenge of the walk but overall people with good fitness can join this trip. The beauty and variety of the walk make the effort all worthwhile. Each night, return to your accommodation in Denmark, where you can put your feet up and enjoy the hospitality. For the full Bibbulmun experience combine this trip with their seven day walk from Albany to Denmark which departs before this trip. 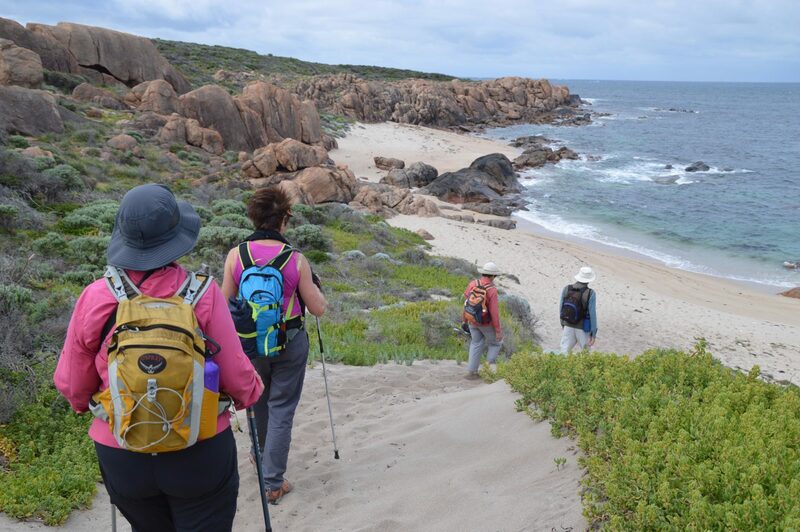 This trip covers the stretch of the Bibbulmun Track which follows the magnificent southern coastline from Albany to Denmark. The rugged coastal scenery and wildflowers on this section of the track are considered some of the best along the trail. Returning to our base in Denmark each evening, this relaxing escape offers the perfect blend of activity and rest with most of the walks suitable for most of reasonable fitness, ranging from 13 to 19 kilometres per day. There are some steep sections and some beach walking, just to keep it interesting. On some afternoons you’ll have the chance to enjoy the lovely town of Denmark or simply enjoy the serenity of the forest chalet where you will be based. The Albany to Denmark section of the Bibbulmun Track is a popular walk for wildflower enthusiasts and those looking for an active, but relaxing, escape. 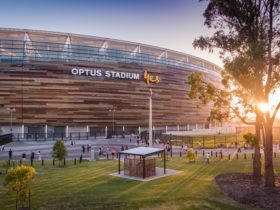 Join their nine day Walpole to Denmark trip directly after this trip and enhance your Bibbulmun Track experience a little further! The Leeuwin-Naturaliste National Park stretches over 100 kilometres along Western Australia’s magnificent Southwest coast. With the world renowned Margaret River wine region at its centre, this coast is as diverse as it is spectacular. From giant Karri forests to windswept limestone cliffs, pristine white sandy beaches, coastal heath as well as ancient dunes and granite cliff lines, the diversity of landscapes makes this one of Australia’s most delightful coastal walks. Walking during the warmer months reveals abundant wildflowers as well daily opportunities for a swim in the ocean and lagoons. This itinerary aims to traverse the entire 135 kilometre Cape to Cape Track, walking between 14 kilometres to 25 kilometres each day with just a day-pack. There are some steep sections, and beach walking can be challenging, however on some days there are options to walk half a day. Excellent homemade food, knowledgeable guides and centre based, comfortable lodge style accommodation which we return to each evening. Come and see why their previous walkers have rated this trek as one of Australia’s best.